I like her style, her laugh, her personality. I love her hair. Whatever the length, it always comes across as purposely tousled, a little messy. It suits her. The thing is, I’ve always thought that style would suit me, too. I feel like that wild mane would fit my personality. The trouble is, I can’t pull it off. It’s not just that my hair is the wrong color and the wrong texture. It’s not only my small stature, short neck or round face. It’s worse than all of that. The fact is, though I think of myself as a bit unconventional, kind of wild, somewhat bohemian, when it comes right down to it, at least as far as the hair, I just can’t stand it. I would pull my hair up into a sloppy ponytail…then take it down, brush it smooth, and secure it into the meekest ponytail possible. I would pull out a few tendrils around my face and neck…and before long would be lifting each strand to tuck it back into place. I would make a loose, off-center, over-the-shoulder braid…but then redo it into a neat, centered braid, secured at both ends. I would get a daring short haircut, imagining something edgy and spiky…but by the time I walked away from the bathroom mirror, I would have tamed it into something better suited to my grandmother. Now, with age, I have settled into a cut and styling method – though not ideal – that works for me. The cut is a slightly layered, long-ish bob. I dry my hair with my head hanging up-side down, then toss my head, letting the hair fall where it wants. Then I take the brush and smooth it all into something very conventional before going out the door. It’s about control. It crops up in many aspects of my life. I rarely sing or dance in public. Though I love bright colors, my home and my wardrobe are mainly black and white. I hold pretty firmly to the theory that there is one right way to do a thing, and I try to adhere to it. Inside, I’m a wild bohemian artist. Cats, for their dignity and reserve, would be the pet that would suit me best. For many years cats were the only pets I had. Cats being cats…and me being me…we spent much of our days just ignoring one another. Settled in my lap if I sat down to watch a movie, curled around my feet in bed at night, basking in the sunshine as I worked in the garden, my cats were companionable but not needy. For several years now, I’ve had dogs instead. They like a little more interaction; they want more attention. They hate it when I leave, are thrilled when I come home and want to be near the action, always. If I’m at the kitchen sink, both dogs find excuse to be in the kitchen. If I am sitting at the desk, they lounge on the cushion beside me. When I am in the shower, Rosa Parks watches from her spot beside the heater. Clover, who hates a bath, waits just outside the bathroom door. Dogs will not be ignored. I find myself chatting with them through the day. Sometimes I just talk to myself about them, knowing that they are listening. Her tail wags in response. She struts proudly in for her reward. Clover sleeps on her own cushion beside my bed. Rosa Parks starts out in the bed with me. My sleep is altered by her presence; I’m aware of her movement just as if I had a small child in the bed with me. Most nights, once she knows for sure that the time for pets and pats, ear-scratches and belly rubs is over, she curls up at the foot of the bed. Sometimes, especially on cold nights, she moves up to the “spooning” position, tucked in behind my knees as I lay on my side. Now and then she chooses to sleep on my pillow, in the space between the top of my head and the headboard. Usually, mornings after sharing the pillow with my small dog, my hair looks like a rat’s nest. Or maybe a dog’s nest. 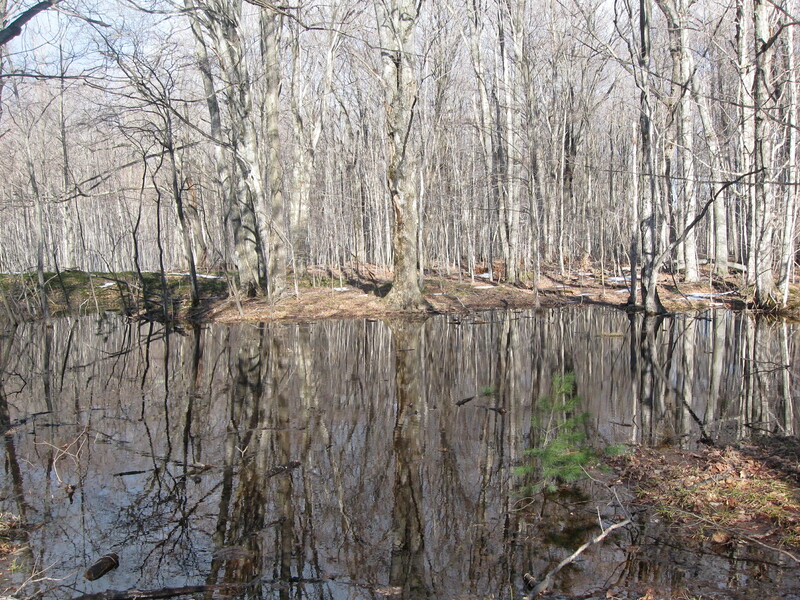 With warmer temperatures and Spring breezes, the snow is melting fast. 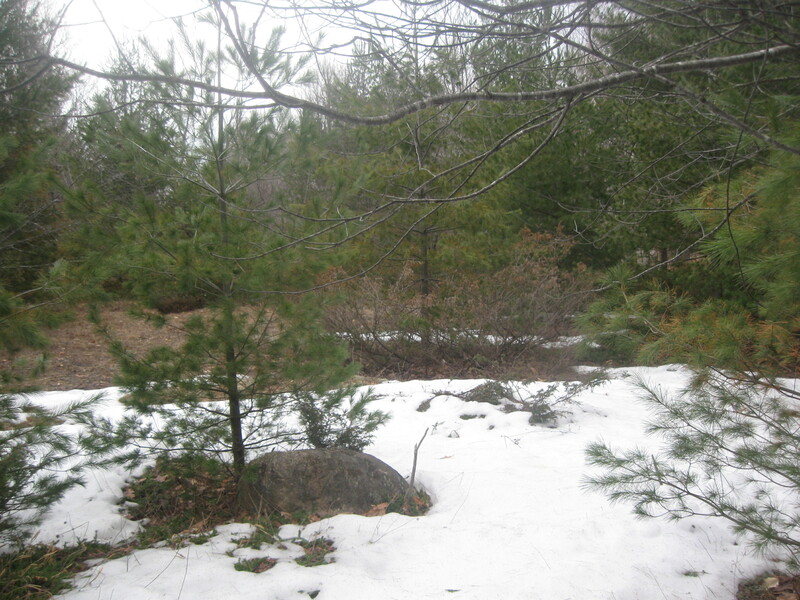 Off the path and into the woods, though, there are traces of winter, still. The ice breaker came in to the harbor here on Beaver Island, and our ferry boat has now made three trips to the mainland and back, right on schedule. There is still ice out there, moving around based on the wind direction and currents. Sometimes it jambs up the north shore, sometimes crowds back in to Paradise Bay. It will all be gone soon. 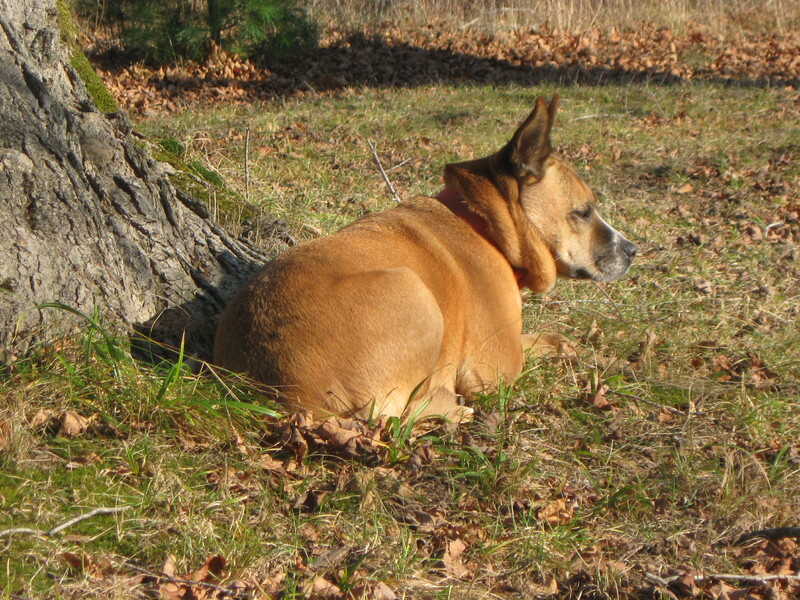 My old dog is still with me, though I watch her closely for the signs of discomfort. She has learned to get along quite well walking only on three legs. The other day, in fact, she managed to tear a giant hole in the back of my garden fence, then leap through it in an effort to get to a cat that was lounging on the roof of the garden shed. The weather has been pleasant, and she enjoys being outdoors while I’m working in the garden. When her time comes, I’ll bury her in that spot in the front yard near the snowball bush, where she sits right now in the sunshine. I’m still here, though I haven’t been visiting or writing on this site much. I’m still struggling with incorporating my new enterprise into my life. I have neglected my personal pursuits – my studio work, this blog and my other writing – for the necessary tasks involved in putting out a news magazine. It’s a matter of shuffling things around, until a balance is reached. That’s what it takes whenever a new challenge comes into my life. It doesn’t seem to matter what brings the change, or how welcome it is…there is always a struggle. The thing that has brought this particular endeavor beyond the realm of a normal transition is the #&@*%# computer. Actually, the combination of a new computer with a different program and – entirely new and foreign to me – design software. I have sat in front of the screen trying – unsuccessfully – to make it work until I was ready to weep…until I was weeping…day after day, until I was ready to throw the whole shebang out of the second story window. I came to the conclusion that I cannot do this alone. It is hard to admit defeat! Harder still – for me, at least – to ask for help. With little to offer in the way of compensation for the trouble, I asked. Several people went out of their way to assist. We are getting it together! As soon as details are worked out, I’ll have more information. Meanwhile, I feel like I may be getting a little bit of my life back! And I’m happy to be back here! This is a sight I’ve grown accustomed to. 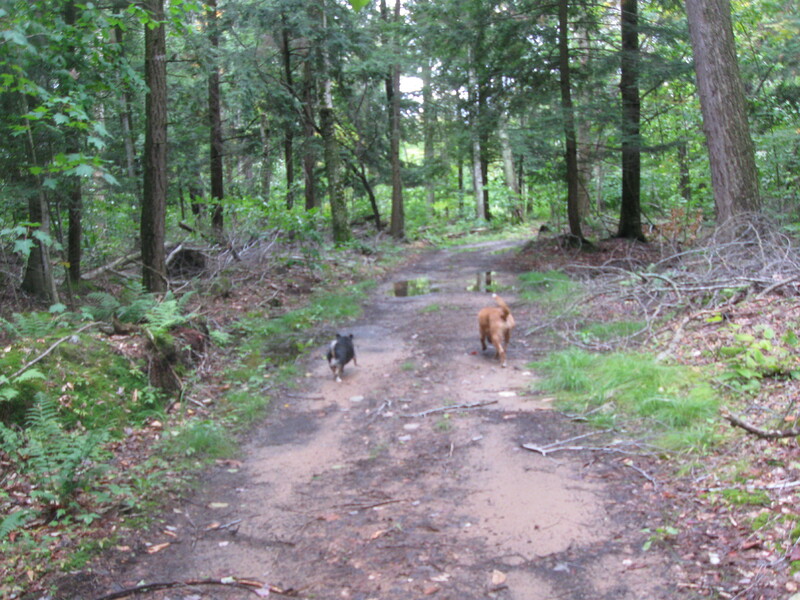 I have many photos like this taken at all times of the year: two dogs ahead of me on whatever path I choose: ears alert to sounds of chipmunk or squirrel, sniffing the air for whatever information the smells give them; tails always wagging. 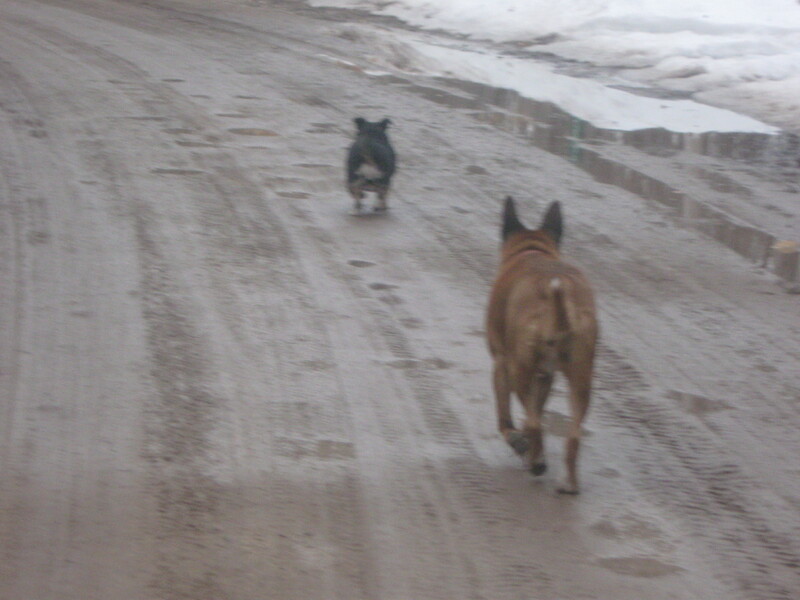 Sometimes the big dog takes the lead; sometimes it’s the other way around. This one was taken in March of this year, on one of our last walks. My big dog, Clover, developed a limp about a month ago. I thought she twisted her leg stepping through piles of deep, softening snow, or that she slid on ice. When it didn’t improve, I took her to see Jeff, my boss and our island veterinarian. She had almost entirely quit using the troubled leg. X-rays showed something on her bone. It was probably a growth, but maybe caused by a trauma. Had she been bumped by a car? Certainly not that I was aware of. We put her on gentle pain medicine, and gave it some time. After ten days, when it only seemed to be worsening, more extensive X-rays were called for. Consultations with another vet, a pathologist and a medical doctor followed. Definitely a growth…and spreading quickly. “You won’t want to have that limb amputated,” Jeff said, more as a statement than a question. How could she adjust to that? 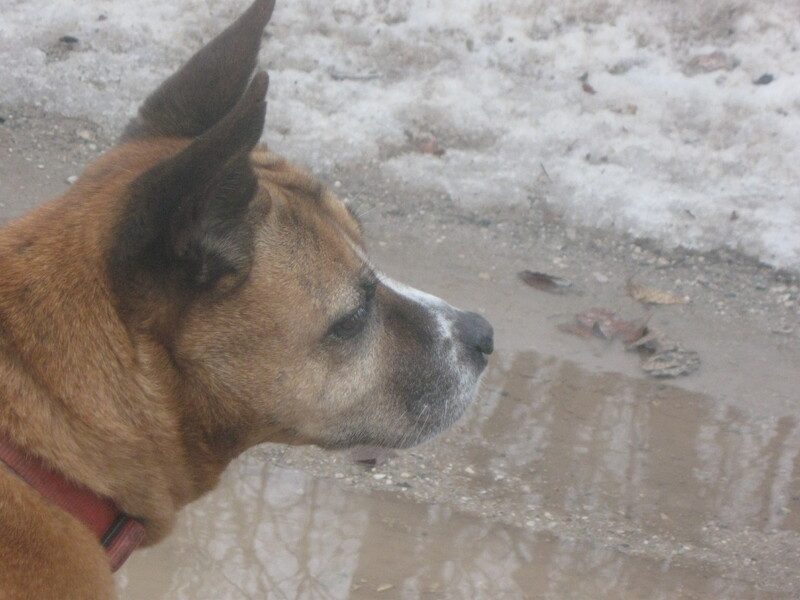 Clover, who has always loved the outdoors, who never missed a walk, who would take a car trip down to Fox Lake, but always chose to run the two miles home, will not, at this stage in her life, suffer that indignity. She has been with me for nine years. She was my daughter’s dog before that, after she rescued her from a life on the street in Tennessee. It was my granddaughter, Madeline, that named her. The first veterinarian she saw then, more than eleven years ago, estimated her age to be about seven. He also suggested she had probably been a part of the dog fighting industry. She showed signs of having lived a pretty rough life. She’s had it pretty good since then! Kate and her family adored her. When they were moving, and couldn’t keep her, she came to Beaver Island to live with me…and I quickly grew to love her, too. That appeared to be true when I said it. The deeper truth was, I needed time to get used to the idea of life without her. About the very moment that Jeff left for a week away, the pain worsened. I have increased Clover’s dosage, and still she whimpers in her sleep. She comes to lay her heavy head in my lap and gaze up at me, confident that I can help her. She stubbornly climbs the stairs – with difficulty – when she wants to, though I jump to get her when I hear her attempting to come down. With one front leg unusable, I’m afraid she’d topple down the stairs. She is laying now on her pillow on the floor beside my chair. Jeff will be back on the island soon. I have a few questions, but I know, pretty surely, the direction this is taking. Clover has been a good companion, and has always trusted me. I can’t let her down now.